Deik Professional 8 inch Chef Knife is designed for professionals who include chefs, culinary experts, food caterers as well as an ordinary person. It is a multipurpose knife that is ideal for various tasks which include cutting, chopping, dicing and slicing vegetables, fruits, fish, meat and other food. 1. 100% Stainless Steel Blade. 2. Comfortable grip for easy maneuvering. 3. 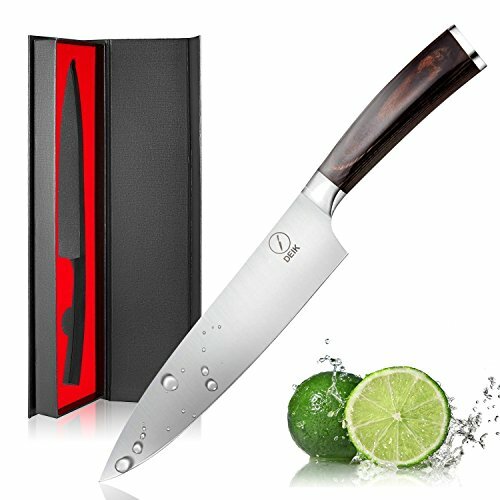 8 Inch Blade cuts easily through large pieces of meat, vegetables, and fruits. 4. Tarnish-resistant, rust-resistant, and easy to clean stainless steel blade. through meat, vegetable and fruits making it a great addition to any kitchen. How to care for Deik Knife? and if water is left on the surface before you let a new layer of oxide form, any stainless steel will rust. and then wipe the rust on the knife part, it can remove the rust. 1. When first use, please clean the knives. Don't test it with fingers. 2. After each use please clean and store in a safe place, store away from children reach! 3. To maintain your knives, please wipe away the water and keep dry and clean. 4. Deik knife has lifetime warranty. If you have any problem, please free to connect us. CARBON STEEL BLADE: Higher carbon content (0.6%-0.75%> normal 0.3%), easier to keep the blade sharp and hold its cutting edge for longer time. The knife excels at all tasks at filleting, carving, dicing and slicing thanks to its thin, razor sharp edge. MULTI-FUNCTIONAL: One knife for all. The sharp kitchen knife is suitable for multipurpose knife for any applications, suitable for for filleting, caring, dicing, slicing, chopping and also removing bone. It comes with a HRC( Rockwell Hardness Scale) of 58-60 which makes it among the tough knives in its class. ERGONOMIC PAKKA HANDLE: The knife is characterized by a distinctive, curly shaped wooden handle gives a comfy, ergonomic grip for both left and right hand. The knife has heavy and well-balanced feel in your hands. FULL TANG: Full tang knives feature a tang that extends the whole length of the handle, which helps to provide strength and balance. This gives the chef's knife a longer life and is less susceptible to damage. GREAT GIFT IDEA: Lifetime warranty and gift box packaging.